Having visited most of your websites, I see that many of you are using videos on your sites and many are also using “squeeze pages”. Unless you have been living under a digital rock over the past year, you probably have noticed that nearly EVERY guru is using dead-simple video squeeze pages templates for their product launches and free reports. Most of them have little to no copy on the website at all. It’s no secret that these squeeze pages work, or else why would they be using them, and selling out every time they do? Answer…They wouldn’t! Its clear to everyone following these launches that video converts. Video works like gangbusters, and it’s really easy to start using video in your own business. How can you make sure which layout will yield the best results? Every guru will tell you something different, because they can only speak from their experience. The results you should care about are your own! You should always be testing, and finding news ways to increase your conversions. That is why I recommend this package. You are going to be getting 56 unique squeeze page templates that you can use right away for your offers. The best part is that you can split test designs, and track your results. Each template is coded, and designed to be super flexible so that they will fit any niche under ANY economic condition. So whether you’re in the Dog Bone market or Forex, you will be able to use these templates and start seeing the real results. 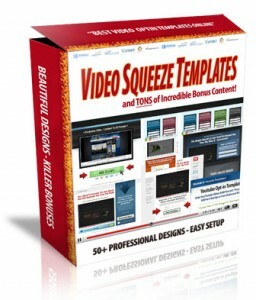 Now YOU CAN put up a Professional Looking video squeeze page in just minutes! And skyrocket your optin rates.